You will need a clock with second hand, a mirror and a glass of cold water. DO NOT bite on the rim of the CHANNELS, but WITHIN the channels. If you bite the rim, wearing the device could be painful, as you will tilt your jaw. The importance of the teeth indents is to provide support in holding the jaw forward. Insufficient support will cause extra pressure to be put on the few teeth that are doing the work possibly leading to pain and discomfort. Boil sufficient water in a container deep enough to submerge the mouthpiece – except for the handle. Do not leave the SnorBan® in the water whilst boiling. Remove the water from the heat source and, holding the handle, dip the SnorBan® mouthpiece in the near boiling water for 12-14 seconds. This is all the time needed to soften the plastic. (NB! Exposing the mouthpiece to heat for more than 15 seconds will damage it). Lift SnorBan® out of the water and shake off any excess water. The plastic hardens rapidly so you must move quickly. The plastic will feel warm but will not burn you. Using a mirror, open your mouth wide and place the SnorBan® in it, TOP side up (the upper half of SnorBan® has a small V-shaped indentation by the front teeth). Place the SnorBan® over the bottom teeth, fitting the teeth cleanly between the channels. Push your lower jaw forward so that the teeth are edge to edge and bite down firmly. Next put your thumb and first finger in your mouth on either side of the device and pressing inwardly hard, push from the front teeth through to the back. 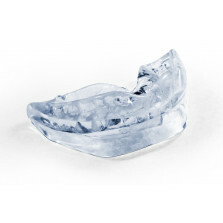 At the same time push your tongue against the upper and lower inside front area of the SnorBan® mouthpiece. This will ensure a tight fit against your teeth. When the mouthpiece has cooled, remove it from your mouth and dip it into a glass of cold water for about 10 seconds to set it to your custom shape. Place the mouthpiece back into your mouth to evaluate the fit. Your lower jaw should be held in a comfortable forward position. If not, repeat the fitting, though this time the device should be heated for only 12 seconds. (You may remold the mouthpiece no more than 3 times). Cut off the handle as close to the mouthpiece as you can. If a sharp edge remains, slightly heat a metal spoon and use it to roll (not drag) the sharp surface smooth. If your snoring does not completely discontinue, the fitting can be repeated by extending the lower jaw slightly more forward.